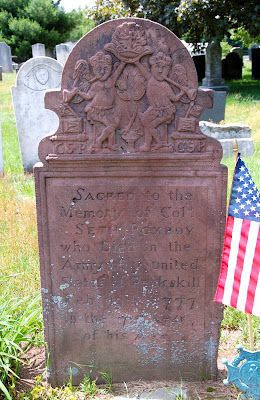 Vast Public Indifference: "Died in the Army of ye United States"
I spend a substantial amount of time reading about the American Revolution, but until I visited the Bridge Street Cemetery in Northampton, I had never heard of Major Brigadier General Seth Pomeroy. The more I learn about him, the more surprised I am that he is not one of those remembered among the second tier of founding fathers. Pomeroy's story has all the makings of a good folk hero tale — he was a frontier gunsmith who took part in the Louisbourg expedition, fought at Lake George during the Seven Years' War, and, at age 69, rode 100 miles in a night to help defend Bunker Hill. He kept journals — there's even a poem about him. Seth Pomeroy would be a good character for historical fiction — he was everywhere and he seems to have been a bit eccentric. 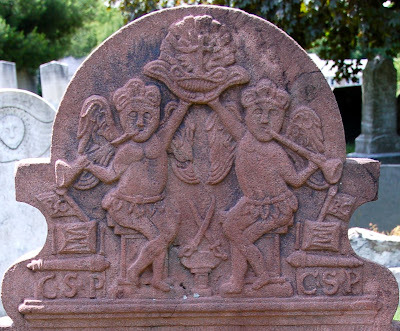 The sources indicate that Pomeroy is not actually buried in Northampton. He fell ill and died in Peekskill and was buried in an unmarked grave. I haven't been able to find any mention of his body being relocated, so I suppose the monument in Northampton is a cenotaph. The stone, carved by Nathaniel Phelps, would be interesting even if the deceased were unknown. What caught my eye was the use of the term "united States." I wonder when the stone was actually carved — if it was erected before 1780 or so, it may be one of the first times those words were carved on a public monument. The imagery is interesting, too. The "CSP" stands for "Colonel Seth Pomeroy," but I have no idea what the "BG" on the little flags might mean. Guesses? Pomeroy received an appointment as brigadier general in the Massachusetts army in 1775. Later the Continental Congress offered him the same rank, but he declined on account of age and jostling among the New England generals. Is it the case then that he served only with the Massachusetts militia, but never under the direct command of the Continental Congress? If so, the "Army of ye united States" bit is even more interesting. Yeah, brigadier general is better than anything I've been able to come up with. The only thing that makes me hesitant about that interpretation is that the epitaph calls him "Colonel." Is that a cross at the top? That would be fairly unusual for this time and place, no? To add to the confusion, Pomeroy did receive the rank of major general, but only in the Massachusetts militia and only after he declined the rank of brigadier general in the Continental Army. In early 1777 Pomeroy came out of retirement to lead troops south to aid Washington. Although his troops were Massachusetts militiamen, I believe he was then acting under Continental Congress command; I don’t know if he had a colonel’s rank. That was the trip when he died. This Massachusetts D.A.R. book on Northampton notes the discrepancy between Pomeroy’s cenotaph and the ranks he eventually held. till end of civil war!